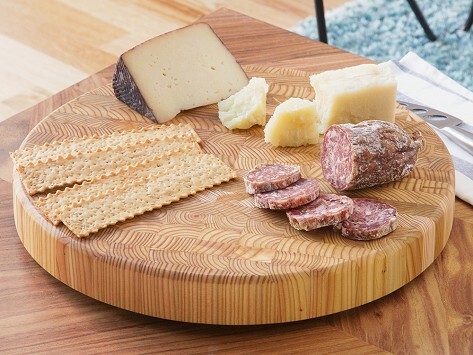 The wood from this self-healing, end grain cutting board is harvested and assembled in a small, Nova Scotia mill. They cut it to expose the intricate patterns and gradients of the growth rings. But besides the aesthetic benefits, the fibers are lined vertically to close and heal after you’ve cut them. That keeps knives sharper and your board cleaner. It even has rubber feet to prevent moisture from getting trapped. With proper care and seasoning, this heirloom Larch Wood board will last you a lifetime. 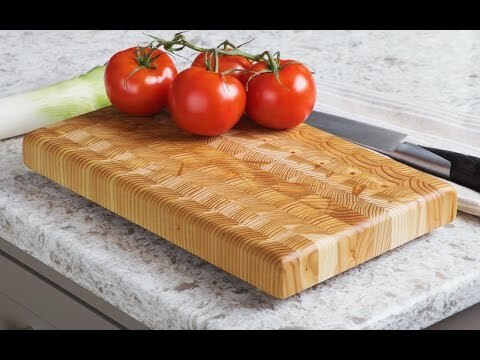 Dimensions: 14.5" D x 1.625"
This glossy, end grain wood cutting board is self-healing and life-lasting. Each board is harvested and assembled from Larch logs in a small Nova Scotia mill. The wood fibers are lined vertically so they can close and heal after you’ve cut them. The flexible end grain will self-cleanse and squeeze out any excess color, bacteria, or food, and the rubber feet prevent moisture from getting trapped. Besides its magical healing properties—the board has intricate gradients and patterns that you’ll uncover by cutting across the growth rings. Chefs praise the density of end grain because it absorbs the impact of blades and even helps keep them sharp. With proper seasoning and care, a Larch Wood board will be helping you prep and looking great for generations.